Importer: NexTorch, Inc., of Mukiteo, Wash. Hazard: Batteries can overheat and rupture, posing a fire and burn hazard to consumers. 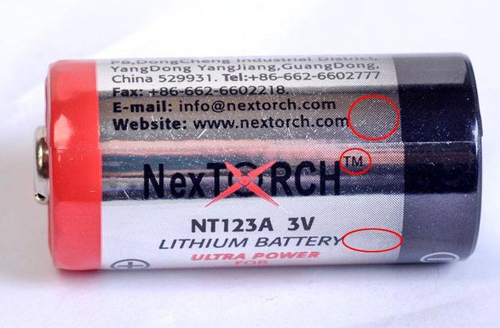 Incidents/Injuries: There has been one report of NexTorch NT123A flashlight batteries rupturing and catching fire, causing burns to the consumer's body, clothes and vehicle. Description: The recalled product is a NexTorch NT123A flashlight battery, bearing the trademark â„¢; superscript, rather than registered trademark Â®; superscript. Its body is silver metallic-colored and has the NexTorch logo and the voltage (3 V) on it. 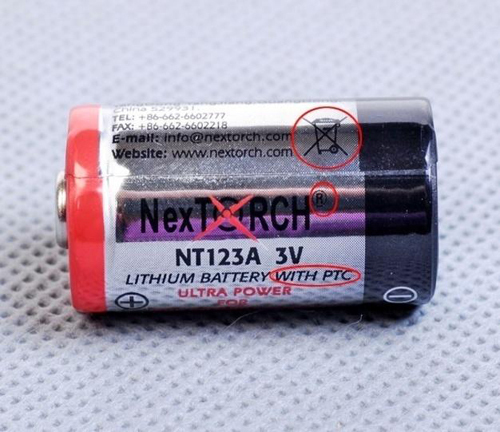 The battery is often packaged with NexTorch flashlights. Sold at: Firearm dealers and law enforcement supply stores, and on the Web, including amazon.com and the firmâ€™s website www.nextorch.com, from July 2007 to July 2011 for about $2 per battery. Remedy: Consumers should immediately stop use of the battery and contact NexTorch for instructions on how to receive a free replacement.